Listening to audio books has become a popular way of consuming the written word. The main advantage of it is that you can listen to an audio book on the go, for instance, when driving or walking. What’s more, audio books can be a great tool for language learning. In this post you’ll find out how to use them for this purpose and where to look for Italian audio books. Audio books (“audiolibri”) are gaining popularity also in Italy. This means that more and more books are available in this format. There are numerous places where you can find book recordings in Italian. Liberliber – is a digital library and music archive. This non profit organization of public benefit has currently 54 audio books available for download. Librivox – Librivox doesn’t specialize in Italian audio books. Their aim is to make public domain books of all languages available in the audio book format. You’ll have to filter for Italian to find what you’ve been looking for. There were 122 audio books in this language available at the time of writing this post. Progetto Babele – This literary magazine has a nice collection of audio books in Italian, which you can download free of charge. Apart from conventional novels, you can find many science-fiction and fantasy audiolibri. You can, of course, simply buy audio books. You’ll find them in traditional bookstores as well as on dedicated websites (such as Emons). The choice is really wide but you should be aware of regional restrictions. For instance, Amazon and Audible limit content due to licensing agreements. This means that even if you buy full access to Audible you may not be able to listen to all the audio books, you’d like to. As it all depends on your geographical location, you’ll have to find out for yourself what you can and what you cannot access, for instance, by trying Audible out for free. You should also check whether Amazon will work for you by starting a free account. Other good sources where you can buy audio books are Google Play and iTunes. Now that you know where to find audio books, you need to learn how to use them for your language learning purposes. The best way to benefit from them will differ depending on your level. When you’re only starting to learn Italian, listening to “The Divine Comedy” won’t do much for you. You will understand little of what’s being said and you may even get discouraged from learning the language, overwhelmed by its complexity. If you’re a beginner rather try… kiddies books. Books for children are designed in a way to express sometimes complex ideas in simple words. The vocabulary in such books is expanding as the target reader is growing. By listening to kiddies books your confidence will be growing slowly. Once you feel you’ve progressed enough with your listening skills, you may upgrade to a more advanced level by trying out audio books for older children. Another good way of using audio books at lower levels is to buy the ones specifically prepared for people learning Italian. 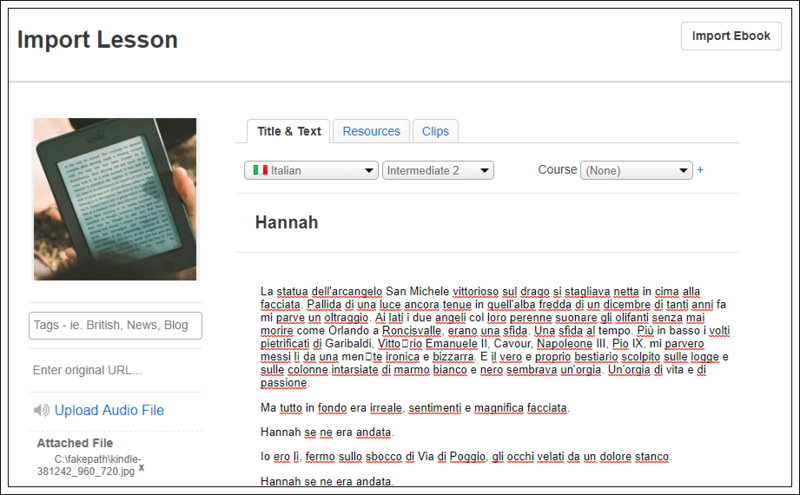 The blog Italiano Facile written by a number of teachers from Venezia offers a very nice compilation of such audio books with links to places where you can purchase them. As your Italian gets better, you can also move on to more difficult audio books. Try listening to thrillers or romance novels, as they’re often less demanding in terms of vocabulary than regular novels. You can also attempt to read young adult literature as long as it’s not sci-fi or fantasy, which can be challenging even for quite an advanced speaker. If you prefer high literature, a good idea is to listen to a book you have already read in your native language. This way it would be easier for you to realize when you misunderstood something. You can also listen to the same chapter a few times and make notes. One difficulty that you’ll encounter when dealing with Italian books (even in audio form) is the use of past tense. At your level you’re probably quite comfortable with using passato prossimo and imperfetto (and maybe even trapassato prossimo?). However, the tense that you’ll encounter a lot in written language is the one you may be the least familiar with, namely, passato remoto. When you can see the verb, it’s quite easy to guess the meaning provided that you know the main verb eg. cantare (to sing) – lui cantò (he sang). It may be slightly more challenging when you just listen to it and you don’t have it in front of your eyes. One way to avoid the problem is to help yourself with transcripts. They’re particularly easy to get in the case of audio books based on public domain books. You can easily (and legally) download the audio book and find an online version of the book to go with it for free. Are you already an advanced speaker? You can listen to anything you want. Just bear in mind that listening in order to “read” the book and listening in order to improve your oral comprehension skills are two different things. You’re aware by now that you don’t need to know every single word to understand most of what’s being read to you. That’s great for when you just need some language practice or you’re listening to an audio book in Italian for pleasure. However, if you want to expand your vocabulary you’ll have to write down sentences and phrases you don’t understand. You can try to guess their meaning from the context and then use a dictionary to verify your guess. Not sure what you’ve heard? Listen to it again and again until you know what the word is. Only use a transcript of the actual book in case of emergency (e.g. you can’t understand which romantic partner the main character has chosen). 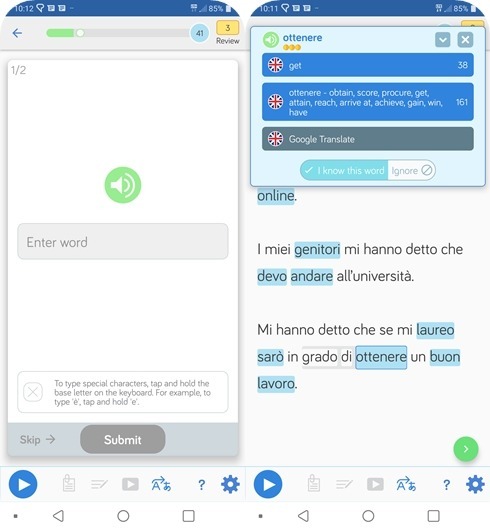 You can always import your Italian audio books into LingQ to help you study. Why do this? Well, using LingQ you can listen to the audio and read along (as long as you have both audio and text) and easily look-up new words you come across without having to pause and open another dictionary. What’s great about this is that you don’t disrupt your reading flow. Let me quickly show you how you can import Italian audio books using LingQ. For this example, I’ll use an audio book from Progetto Babele. LingQ has a variety of additional features to help make your reading easier. Such as sentence mode viewing and the ability to create flashcards out of every new vocabulary you save. It’s also available on mobile too, so you can study anywhere and anytime. Learning Italian using audio books can be really fun. It may allow you to create a mini language immersion experience, help you improve your listening skills and learn new vocabulary. It’s also a nice pastime and you may even find your next favorite author thanks to it. Good luck! Magdalena Osiejewicz-Cooper has lived in Bologna and Palermo. Apart from Italian she speaks fluent Polish and French. She is currently self-studying Spanish.